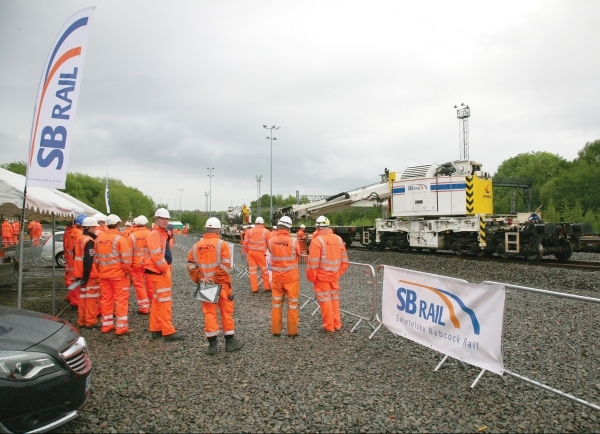 In the spotlight this time were SB Rail’s patented robotic arm, the KRC 500 S crane system with ‘Tandem Tensioning’ and Automatic Sleeper Relaying Beam. First off, the KRC 500 S was shown lifting a 27m long panel in lieu of an F switch. The robotic arm was then demonstrated lifting, tilting and completely spinning a panel in a series of manoeuvres not possible with conventional crane ropes and pulleys. Finally, the Automatic Sleeper Relaying Beam was shown lifting, automatically spacing and accurately placing sleepers 28 at a time. Despite the weather the session was well attended with everyone having chance to see the equipment being demonstrated and ask questions. Of particular interest on the day was the speed and accuracy of the Automatic Sleeper Relaying Beam. SB Rail thanks all those who attended and we look forward to holding a further event to showcase the capabilities of our latest KRC 250 with extending counterweight soon.